The Not So Professional Beer Blog: Oregon Brewers Festival: The Buzz Beers! Two weeks ago, I published the Oregon Brewers Festival's 85 beer lineup. The festival organizers have just confirmed to me that they have purchased a minimum of 20 kegs of each beer! So what exactly are Buzz beers? While most of the beers in the regular lineup are broadly distributed (broad is a relative term), Buzz beers are produced on a more limited basis. Many were made exclusively for OBF, so this may be your only opportunity to try some of these brews. Buzz beers will be served only in the Buzz Tent. So look for the aforementioned tent. Quantities of Buzz beers will be very limited—just a keg or two of each (compared to the 20+ kegs for each of the regular beers). About 8+ Buzz beers will be poured at any given time. 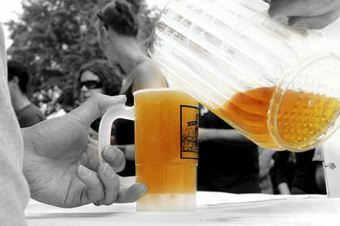 Follow @OBFBuzzTent on Twitter for periodic updates on what’s pouring. So between the regular and Buzz lineups, you'll have nearly 140 options! Is that enough beer for you? Which Buzz beers are you planning to taste? Click for more interesting facts about Oregon Brewers Festival. Check out my OBF tasting suggestions that you can download and take to the fest! 7/29 update: Late Friday night, OBF announced that the Buzz Tent is closed for the rest of the weekend. The Buzz crazy crowd emptied all of kegs during the first two days! Don't worry, there are still 85 beers left. I was able to taste two Buzz beers. Check out my OBF Day 2 summary for the details. Fort George's Buzz Beer is the Magnifera INDICA Belgae ... AKA "Mango Beer"
@Anon: I'll keep an eye out for that one. Thanks.